a) To establish an easy "sight and feel" method for the quality evauation of cast surface finishes. b) To make available a Cast Surface Comparator with MSS surface rating numbers 1 through 10, to be used to monitor surface finish by a visual and tactile method. c) To provide guidance on surface finish by "sight and feel" to minimize misunderstandings which may occur between purchaser and manufacturer. 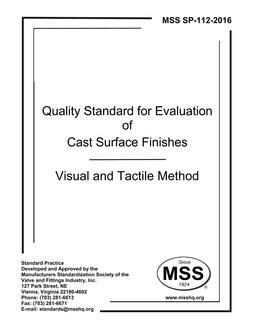 1.1 This surface quality Standard Practice provides criteria for the visual and tactile evaluation of cleaned AS-CAST surface finishes of components manufactured from castings. 1.2 This Standard Practice and its supporting MSS Cast Surface Comparator may be applied to surfaces formed by any casting method. 1.3 This Standard Practice provides visual and tactile criteria for evaluating casting surface finish and texture, which can be used to develop an acceptable quality level. 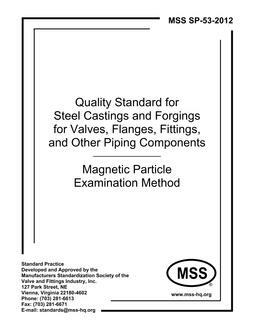 1.4 Cast surfaces on materials such as gray iron, ductile iron, bronze, and malleable iron may be compared with the use of this Standard Practice; however, it is not the intention of this Standard Practice to limit comparisons to only these types of materials. 1.5 This Standard Practice does not apply to machined surfaces or those surfaces that are intended to be machined. 1.6 This Standard Practice is limited to "sight and feel" by comparison without measurement. Luster and color are not part of this Standard Practice. 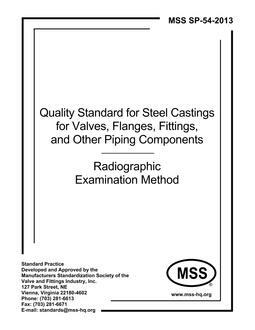 1.7 This Standard Practice is not intended for use on those castings where burn-in, slag, scabs, etc. so distort the surface that the comparator cannot be used and the casting may be rejected for other causes.